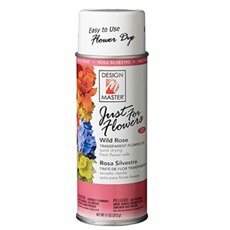 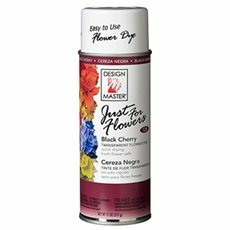 DESIGN MASTER Just For Flowers is translucent, flower dye in a convenient spray application. 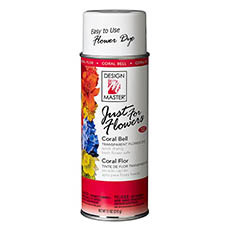 It instantly colours any flower without concealing the blossom's delicate features. Fresh, silk and dried flowers become infused with a natural impression of colour. Just For Flowers' translucent nature allows underlying colour to visually interact with the dye colour. Change a basic white blossom to a dye colour or blend and accent hues on coloured blossoms. Features are ultra-fast drying, translucent colour, doesn't hide blossom details, natural looking addition of colour, use on all types of flowers including fresh, enhances fresh flower life - slows down evaporation of moisture through petals, match or coordinate colours, enliven blossoms with more brilliance, shift colours to neighbouring hues, ideal for wedding and home decor designs, excellent on satin, sheer and lace ribbons and fabric wedding accessories, modified lacquer-based spray, recoat at anytime.